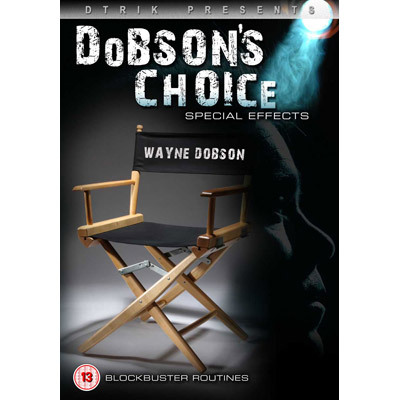 "Special Effects is my latest, and I honestly believe my best book to date. Within its forty pages, you'll encounter thirteen really strong close-up and stand-up routines, and all my own offerings appear here in print for the very first time. I have stripped away virtually all the sleight-of-hand from most of the routines and presented you with a collection of tried and tested 'workers' that are very strong in effect, but equally easy to perform. As I said of one of them, "If I can do it... you DEFINITELY can!" This, I believe, is true of them all. Along the way Stephen Tucker, who wrote the book for me, has suggested some very clever additions, tips, and ideas, and even a complete routine. I have been absolutely amazed that, after being quite the finger-flicker myself for many years, I have been able to retain the strength of each effect, but with the absolute minimum of dexterity being required to achieve it. There are routines with business cards, playing cards, bottles and bottle caps and even one with a silk and a borrowed packet of cigarettes. Finally, I'd like to thank Pat Page, Steve Beam and Stephen Tucker for permission to include their three routines, and YOU for at least reading this brief book description. I hope that you are now considering buying Special Effects. At the next convention we both attend feel free to ask me to show you something from the collection, which I'll be more than happy to do." Guesstimation - You always know how many cards have been cut off. How? Guessin? Estimating? No...guesstimating! Some You Win Some You Lose - This one you win...always! continuous Do As I Do - Pat Page's superb routine with a regular deck of cards and a spectator. Possessions - All you use are 12 of your business cards and a few borrowed objects for this amazing demonstration of the psychic. Mobile Phone Keys - Three times you predict a spectator's actions! ACAAN Almost - A 'Hands-off' version of Any Card At Any Number. Invisible Deck - No deck of cards, and the very first time I've ever tipped the method! Lucky Card - My version of Vernon's classic routine 'The Trick That Cannot Be Explained'. Bottle Opener - The Bottle Vanish routine to end them all. Marked Phenomena - A brilliant routine from Steve Beam where you find the card they thought of and, incredibly, they find the card you t hought of! Silk In Cigarette Box - Does what it says on the tin! Five Card Repeat - My opening stand-up routine for more years than I care to remember. Nailed - A six inch nail, impales a signed, selection.